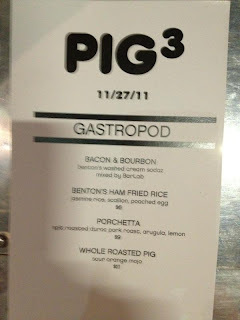 Chef Jeremiah's P.I.G III went down tonight (11/27/11) over in Little Haiti. His gastroPod served up some awesome Benton's ham fried rice topped with a perfect poached egg. I followed that up with a fantastic porchetta sandwich featuring spit roasted duroc pork roast. I washed that down with a killer bourbon and bacon cream soda mixed by the Bar Lab crew. Their tequila punch was even better. I heard some rave reviews about the smoked pork melt from Ms. Cheezious but I didn't have any room left. I did sample some great ice cream from Coolhaus, brown butter with candied bacon, dirty mint chip, Guinness chip, sea salt caramel and more. There was also ear food via Cog Nomen. Great food + great cocktails + great music + great ice cream = great event! !